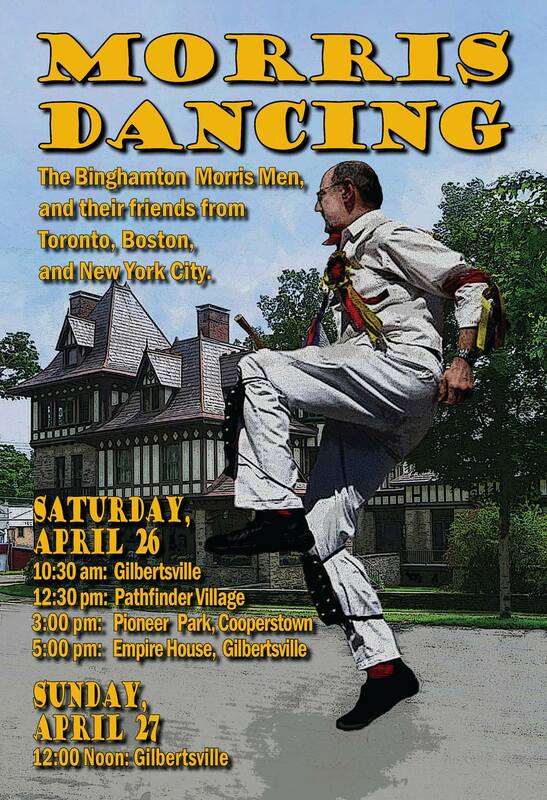 The Binghamton Morris Men will once again tour the Chenango and Otsego County area, giving public performances together with their guests, the Toronto Morris Men, Newtowne Morris Men from Boston, and the Bouwerie Boys Morris Dancers from New York City. G’ville, as it is affectionately known, is the premier dance weekend for Morris men from coast to coast, not to mention dancers in England as well. Our yearly visit to this community is one of the most treasured events of all who attend because of the perfect fit of the dance with the inn, the town and the Community. The weekend spent in Gilbertsville is at the core of the spiritual & artistic center of our team. Morris dancing is a living tradition of dance & music surviving from a time when men lived closer to the soil and the rhythms of the seasons. This ceremonial custom dates back to before the fifteenth century. The dancing was originally said to be part of a ritual designed to shake off the dark & gloom of winter and to celebrate the coming of Spring. The Binghamton Morris Men and various friends from Toronto, New York City, Vermont, Boston, Washington, Maine, Vancouver and other points have been performing here for 35 years. Morris first discovered Gilbertsville as a place to perform as part of the week long tour of the American Travelling Morrice in 1976. Ever since 1977 they’ve stayed at the The Major’s Inn & performed there at least one spring weekend. The Binghamton Morris Men have performed at the Newport Folk Festival, the Rockefeller Estates, the Metropolitan Museum of Art in NYC, every tourist town on the coast of Maine, the Old City in Montreal, the Seaport of San Franciso, Oxfordshire in England… but the event that no man wants to miss is the weekend in Gilbertsville, NY! For more information or for bookings, contact Ken Kearns. In 2010, we were featured in the March 14, 2010 episode of Mohawk Valley Living television show. Look for us about 3:45 into the video. Gilbertsville _ Despite chilly temperatures and a spring snow flurry or two, there was dancing in the streets of Gilbertsville this weekend, compliments of the Morris Men. For the 35th consecutive year, a group of 40 men hailing from Binghamton, Toronto and Boston traveled to Gilbertsville to perform dances from 15th century England. True to their tradition, they checked into Major’s Inn at the corner of state Route 51 and Commercial Avenue on Friday night.